This upcoming Friday night at the Main Street Armory in Rochester, New York the next edition of Showtime’s ShoBox series will take place. In the broadcast’s main event Lynn, Massachusetts native Ronald “Akeem” Ellis (15-0-2, 10 KOs) will take on DeAndre “Axeman” Ware (12-1-2, 8 KOs) in a ten-round Super Middleweight (168) bout. Ellis is a 2010 National Golden Gloves champion where he defeated super middleweight contender and 2012 U.S. Olympian Terrell Gausha in the finals. Standing at over 5’10 with a 77-inch reach, Ellis has some physical advantages over his opponent and will look to a victory to further pursue a goal of winning a world title. Ellis’s opponent Ware is coming off of the first loss of his professional career. Ware lost a unanimous decision to Germany’s Cem Kilic in September of last year. The bout with Kilic was taken on short notice hindering Ware’s performance. However for Ellis, the Toledo, Ohio native has had a full training camp. Ware has been boxing for less than ten years and currently holds a job as a firefighter in the Toledo, Ohio area. The bout between Ellis and Ware will be contested for three vacant major regional titles including the NABA, United States Boxing Organization and WBC Continental Americas super middleweight titles. Ellis will be making his fourth appearance on the ShoBox platform with his most known bout being a draw against Roc Nation’s Junior Younan in February of last year. Both men have much to prove against one another with bigger opportunities awaiting the pugilist who comes out with his hands raised in victory. The two fighters know what’s at stake and are treating the match as the most significant of their respective careers. The primary supporting fight on the undercard will feature an eight-round Lightweight (135) contest between two undefeated fighters. Cleveland, Ohio’s Thomas “Gunna Man” Mattice (13-0-1, 10 KOs) will take on New York’s Will Madera (12-0-2, 6 KOs). The bout is taking the place of a scheduled match that featured Hawaii’s Logan Yoon who suffered a knee injury in training camp. Yoon would have faced Mexico’s Richard Zamora in a Super Lightweight (140) contest. Mattice will be appearing on ShoBox for the fourth time. In his previous two bouts, Mattice faced off with Armenia’s Zhora Hamazaryan. In their first bout, Mattice received a controversial split-decision victory in a match where he was knocked down in the second round. In the rematch, Mattice fought another closely contested bout with Hamazaryan that resulted in a draw. Before stepping in the ring with Hamazaryan, Mattice was on a six-fight knockout streak that he looks to continue against Madera. Madera is a former three-time New York Golden Gloves champion. 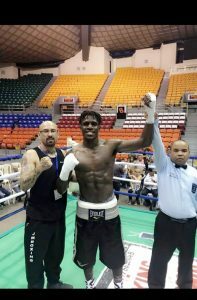 After falling to two consecutive draws in late 2017 and early 2018, Madera returned to his winning ways scoring a second-round stoppage over Curtis Niko Morton in September of last year. Starting the night’s festivities will be an eight-round super featherweight contest between the unbeaten Abraham Nova (14-0, 10 KOs) and Ghana’s Oluwaseun Joshua Wahab (16-0, 10 KOs). The ShoBox: The New Generation series has been an overwhelming success for Showtime. It gives an avenue for up and coming boxers to work on their craft on a national platform. The telecast will feature three fights between undefeated fighters who will be looking to further their path onto greater ventures. As we saw last year with HBO, these kinds of shows are not guaranteed to last forever. Boxing fans should make sure to tune in to not miss any action.